Just a few moments walk from the picturesque harbour, Fisherman's Cottage is ideal for a romantic break with sandy beaches, coastal footpaths and cosy inns right on your doorstep. The most southerly working harbour in Britain, colourful fishing boats can be heard chugging in and out daily to supply the many fine eateries in the village. A food lover's paradise, Porthleven has something to suit all tastes and budgets from a local Costcutter store to Michelin recognised restaurants. Visit Rick Stein's restaurant on the harbourside and sample one of their sharing dishes inspired by his travels. There are several bakeries and take-aways including a delicatessen where you can order a delicious woodfired pizza.The village has a vibrant feel year round with many galleries offering handmade jewellery, glassware, basketry and paintings to name but a few. The cottage is an ideal base from which to explore the local delights. Take a walk to Loe Pool, Cornwall's largest freshwater lake or head west to play a round of golf at the dramatic 9 hole coastal course above Praa Sands followed by lunch on the mile long beach below. Recently refurbished Fisherman's Cottage will suit style savvy visitors with its whitewashed walls and contemporary furnishings. Entrance at street level is into the light and airy sitting room with stripped timber floorboards and sumptuous leather sofa facing the wood-burning stove. As with some quaint Cornish cottages the stairs leading up into the bedroom, which has a king size bed and modern en-suite bathroom with bath and separate double size walk-in shower, are a little steep, as are the stairs down to the kitchen. The kitchen/breakfast room on the lower ground floor has tasteful shaker style units and sleek appliances including a range style electric cooker for the keen cook. A neat dining table offers seating for four. To the rear of the cottage is a covered storage area suitable for bikes or hanging wet-suits out to dry. Parking can usually be found nearby. Over three floors. First floor king-size double bedroom with en-suite bathroom with bath, double walk-in shower and WC. Ground floor Sitting room with wood burning stove. Lower ground floor Kitchen with dining area. WC and store. Note: Regretfully children are not accepted at this property. Helston 3 miles; Penzance 10 miles; Hayle 11 miles; St. Ives 17 miles; Falmouth 17.5 miles. Porthleven is one of south west Cornwall’s hidden, coastal gems, located near Helston, famous for its annual Flora Dance Festival. Situated between Lizard Point and Land’s End, Porthleven retains the feel of a traditional Cornish fishing village, enjoying uninterrupted views of the Atlantic Ocean and the beautiful Cornish coastline. The iconic clock tower sits on the harbour entrance and the pubs, shops, cafés and restaurants cluster around the historic picturesque inner harbour, where there is plenty of boating and marine activity. 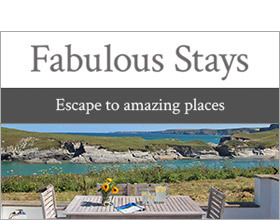 With a warren of streets lined with classic Cornish, granite cottages, an extensive beach manned with lifeguards, the chance for alfresco dining in one of a number of well reviewed restaurants, and crabbing off the harbour, there are plenty of activities for the whole family to enjoy, all year round. Porthleven is building a reputation for eating out with a popular food festival established in the spring. Out of season, Porthleven has one of the best surf breaks in the country where you can sit down and get lost for hours watching the energetic surfers riding the waves. There are some fabulous hidden coves along this stretch of coastline, including Praa Sands, Poldhu Cove, and Rinsey, a magical setting for the more energetic. You may have even seen pictures of Porthleven on television, being one of the best spots in the UK for storm watching, with the crashing winter waves often being used as the backdrop to weather forecasts. Walkers will enjoy the South West Coast Path, adventuring west past Rinsey Head with spectacular views, or south across Loe Bar to Penrose Estate with its National Trust cafe, and on to Gunwalloe Church Cove. Take a trip to the Isles of Scilly by boat or plane and marvel at the display of sub-tropical gardens at the stunning Tresco Abbey. The Eden Project near St. Austell offers an interesting day out. Porthleven is the ideal base for discovering the delights of west Cornwall and the Lizard Peninsula. Note: One small dog will be welcome. Note: Regretfully no children accepted at this property.